The common tawny daylily, Hemerocallis fulva, blooms almost anywhere, including shady woodlands. A growing number of hybrids marketed for the dappled shade are found in many home gardens. Shade-tolerant daylilies will tolerate some shade and still perform well, but no daylily will bloom its best in deep shade. The American Hemerocallis Society has awarded a number of its prestigious Stout silver medals and other prizes to classic shade-tolerant cultivars. The continuous bloom breakthrough cultivar stella de oro won the Stout in 1985 and the Society’s Fisher award for most outstanding miniature in 1979. The grassy-leaved plant grows no taller than 2 feet and is peppered with 1 to 2 inch wide recurved, bright-yellow blooms throughout the summer as new scapes rise to replace faded ones. Stella has become an industry in itself with many varieties including ruby and black-eyed stellas. Stella de oro is widely employed as a landscape-edging plant. 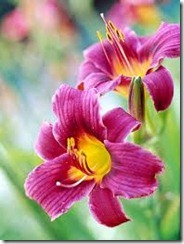 It blooms longest in full sun but blooms reliably for a long period in shaded areas. Deep-hued flowers often fade in full sun, making many of them good for shade tolerance. Lavender blue baby, a reblooming plant, won the 2007 Stout medal and the 2007 Stevens award for most outstanding eyed or banded daylily. Its breeder describes it as a "5.5 lavender-blue flower with a lavender-blue eyezone and green throat." Lavender blue baby is a medium-sized plant with flowers blooming on 28-inch scapes. Its wide, ruffled petals resemble the famed siloam series. It begins blooming early to midseason and is a dormant cultivar. Blue baby hybrids are found on several shade-tolerant lists. An even deeper purple flower, Bela Lugosi, won the Lenington All American award the same year. Painted lady began a line of hybrids. The 1942 Stout winner is an orange polychrome midseason rebloomer with ruffled, star-shaped blooms on 36-inch scapes. This heirloom variety is evergreen in warm zones, meaning it does not go dormant in frost-free areas. Other painted lady hybrids come in shades of lavender and red, some with green or yellow throats; some are also shade tolerant. Hemerocallis fulva ‘Kwanso’ is a hybrid cultivar that dates from 1860. It is large and tolerates full sun to almost complete shade. 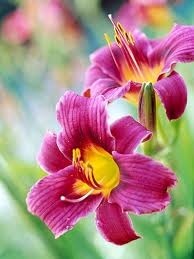 Opinions differ as to how many kwanso cultivars exist and whether they derive from the tawny daylily or vice versa. This plant carries flowers with two or three sets of petals, Inner layers of petals may be twisted like crumpled tissue. Flowers bloom on 36 to 40 inch long scapes over large mounds of wide grassy foliage. They spread aggressively and want division frequently, making them ideal landscape plants for large borders. Blooms begin slowly in early summer and last through summer.